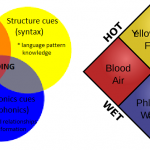 The scientific literacy research shows conclusively that synthetic phonics (building words from sounds) is the best way to teach early literacy. Prime Minister Gillard (when she was Education Minister) declared that phonics had won the reading wars. 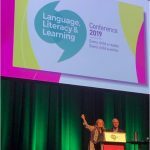 However, many Australian schools are still starting off teaching five-year-olds literacy by getting them to memorise lists of “sight words”, and encouraging them to try to independently read books containing lots of words that are simply too hard for them. This is disappointing, but I guess old habits are hard to change. Sight words/whole language is what most teachers were taught at university, and schools are still full of teaching materials based on this philosophy, so change was never going to happen overnight. To understand the problem with “sight words” and “whole language”, you need to understand a little bit of the literacy science. Here’s a gross oversimplification of how reading works inside your head (with apologies to researchers for horribly blunting their precise instrument for a lay audience). Efficient reading happens via two interacting processes. 1. Words are decoded via sounding out (the “graphophonic route”). 2. Some words – the common, familiar ones – are then memorised and read via the “lexical route”. These two routes interact in a complex, cascading way, providing checks and balances for each other. (If you want more on one model of how this works, click here). Of course to have memorised a word, you have to have seen it a few times before. The argument goes that once you’re a skilled reader, you will have memorised most words, and won’t need to decode words very often. I have a computer full of photos of brand names that are not taught in schools, which today’s children are surrounded by from morning till night. Walk around a supermarket and let your mind boggle about how they might all be memorised. Then there’s Harry Potter’s Quidditch and Dumbledore and so forth, and Pokemon’s seemingly millions of characters, my favourite of which is the Snorlax. That’s before children try to read the street directory or the Footy Record or any of the dozens of other printed materials that contain words they have never seen before, and that keep changing with every new draft, movie, TV show, craze, newcomer’s name and internet search. Memorising “sight words” won’t give learners the tools to tackle all these. A lot of the words on lists of “sight words” are not even remotely irregular anyway, and could easily be taught via a sounding-out strategy. This would give learners two for the price of one – a new word, and a strategy for tackling lots of other words. Just because you teach a word via sounding out, doesn’t mean you have to sound it out forever. The risk you run in teaching a child to memorise words as wholes is that their brain won’t treat them as language at all, it will treat them as pictures. This means it puts them in an inefficient and far-too-finite storage system. Kids who do this often seem to be learning to read OK, but hit the wall in about Grade 2 when they run out of visual memory for abstract symbols. The words “it”, “and”, “in” and “that” are utterly regular, so why anyone’s memorising them is a mystery. 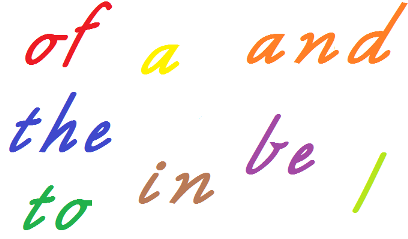 The words “I” and “be” are likewise regular, once you have learnt that vowels behave differently depending on whether they are followed by a consonant (compare “hi” and “hit”, “be” and “beg”). The words “was” and “a” encourage beginners to think that when you see the letter “a”, maybe you say the sound “o”, or “uh”? (you do, in some words, but learners should be learning the most common patterns first). The word “of” encourages children to think the letter “f” represents the sound “v”. The only words containing the letter “s” – “is” and “was” – promote the idea that the letter “s” represents the sound “z”, which it often does at word endings (see this list for more examples), but that is not usually explained or demonstrated. When children are learning sounds and letters, do they believe the teacher telling them that “s” is a “s” sound as in “sit”, or these words and their own senses, which tell them it’s a “z” sound? The word “to” is one of the few words that has “o” representing an “ooh” sound (click here for the rest) , and contradicts what they learnt about the letter “o” from the word “of”, and what the teacher tells them in lessons about the alphabet. The word “the” suggests that the letter “e” represents the sound “u” (as “the” is usually pronounced with the unstressed vowel, see more examples), which can be really, truly confusing, and it would be much better if we stressed this word for beginners (“thEE”) and studied it with words like “me”, “he”, “she”, “be” and “we”. The message a young child gets from these words is: English spelling is very complex and confusing, the teachers tell you one thing in alphabet lessons, but this sample of important words and your senses tell you quite another. This means there’s always plenty of work for speech pathologists like me, when desperate parents bring their confused children in, so they can learn how to pull words apart into sounds, blend sounds together into words and understand how sounds in words are represented by spellings. 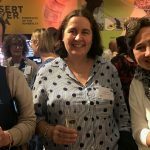 But it causes a lot of misery, and it’s preventable misery, so I hope the readers of this blog will put their shoulders to the wheel and help slowly, slowly turn this educational ship, and put me out of work (speech pathologists can do plenty of other things). This entry was posted in sound-letter links, teaching strategies, theory, whole language, word attack on July 31, 2012 by alison. Hi. My child attends a private school which does 700 sight words and the only phonics they do is reading eggs. They promote using first letter guessing, word shapes, picture clues, context etc. I have done a tonne of research as to why he isn’t reading. He needs phonics. I am doing phonics at home but he is chastised for sounding out. His school has shot me down at every meeting insisting their program is great, and that my child “will probably be one of the 30% of people who never learns to read efficiently”. I am so dismayed and angry at them and am removing him ASAP. I am looking for a suitable public school which only does synthetic phonics. What literacy programs are recommended by you so I can shift him to a school that implements these programs? My child may not be top of the class but he deserves every chance to learn to read and write. By the way thank you for your fantastic blog and resources. I’m very grateful! While I agree with this, it's very hard to avoid this approach when syllabus specifically refers to high frequency and sight words. I've been reviewing my understanding of spelling this year as I've been responsible for my grade's spelling program, and have been similarly bamboozled by the various "sight word" lists which seem to contain lots of words that can easily be sounded out. I understand words like "was", and I teach my kids that these are photograph words because they don't fit the normal rules, but when words like "that" appear on these lists, I scratch my head. Then you add the expectation where the powers-that-be expect you to categorise the words according to the four forms of spelling knowledge (visual, phonological, morphemic and etymological) and it's very difficult when I thought the whole idea was that you integrate all four forms when you spell? Some words may fit solely into one category, but more often than not you are drawing on various forms at various times. The longer I teach, the more I am convinced that nobody knows what the hell they're on about. YES! The sight words lists are a crazy jumbled mixture of decodable words and words with trickier spellings, and of course we should be teaching multiple levels of spelling knowledge at once, it’s crazy to think that children apply only sound-letter rules to “crept” but morphemic rules to “dropped”, they are both past tense. We can’t wait to teach the past tense morpheme, regular and irregular, till we have taught all the main phoneme-grapheme correspondences. Narratives are mostly in past tense, so that’s what kids will be reading. 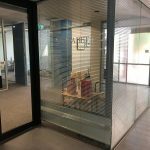 To make sense of the “ai” in “said” we need to refer to phonemic, graphemic, morphemic and etymological knowledge – the sound is a funny one for that spelling; “again” and “against” are often pronounced like this too; it’s the past tense of “say” and follows the same pattern as “lay-laid, pay-paid”, so it was probably pronounced like these words hundreds of years ago, I think some old manuscripts even contain things like, “she sayed unto him…” but the pronunciation has changed. It’s not just a random funny spelling. I agree, the people setting the ground rules for the literacy curriculum and many of those writing the textbooks and workbooks often don’t seem to really understand our spelling system. Sadly. Glad to see that you seem to, good luck with continuing to provide your students with good teaching despite this, until things improve. This is yet another of your brilliant posts. Thank you. It has just been flagged up via the DDOLL network (a brilliant network!). 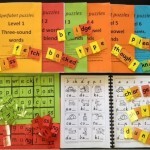 As you may know, I recommend the use of Alphabetic Code Charts showing the complexity of the English alphabetic code from the age of four – or from the age when we start a structured systematic synthetic phonics programme/approach in the teaching context. Add a little bit of age-appropriate ‘history’ of the development of English language in its spoken form (all those different peoples over many centuries) leading to a mix of words – and then when writing became commonplace – a mix of spellings. This gives some practical and intellectual rationale for our complex English alphabetic code – and an explanation of why it is not easy to read and spell in English – thus requiring lots of teaching and lots of practice. This approach also helps to alleviate those feelings of poor self esteem when children (many) may struggle with reading and spelling – blame it on the history and the complex code! Tell the children that the English code is the most complex alphabetic code in the world! Then, when it comes to reading (print to sound) – the sounding out and blending process to ‘discern’ the target word commonly necessitates ‘tweaking’ or ‘modifying’ the pronunciation. This helps with those unusual but common words such as ‘of’, ‘the’, ‘was’, ‘is’, ‘has’ and so on. 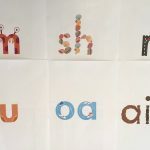 Further, Alphabetic Code Charts designed to show all the spelling alternatives helps to rationalise these apparent differences in spelling-pronunciation. 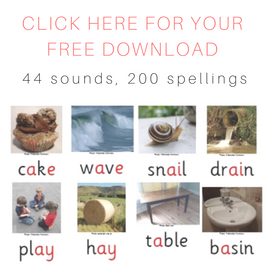 See the spelling alternatives for the sound /z/ for example, where the letter ‘s’ is included. As you and I know, letter ‘s’ is very common as code for the sound /z/ – especially in plural words. The combination of transparent explanation for the children, plus the notion of ‘modifying pronunciations’ as required when reading, I have found really helps in the teaching and learning of the English language. Of course the spoken side of the English language is also essential – and children learning English as an additional language will not be able to ‘modify’ pronunciations without the teacher stepping in to tell them (also children decoding words not in their spoken language even when English-speaking). How should I best teach her to learn these so she can feel like she is moving up levels. She is still on the first 12 golden words and many have moved up to the second list. I am taking the slowly slowly approach with the words, we only look at them through a game where we might rhyme, play snap, bingo or make a shape with the 12 words. I am not worried that she is behind the others as I want her to understand the words but would love to hear what you think! Hi Vanessa, I think it would be much better if kids learnt high-frequency words in spelling pattern groups e.g learning “me”, “she”, “he”, “we”, “be” and “the” all together rather than them being scattered through the list as though there were no pattern to be learnt and they were just things to memorise holus-bolus. There are heaps of patterns in these lists so no need to treat every word as though it has no pattern to it and should just be swallowed whole. My son has just started school. We like the school, but they are using the golden word lists and sent him home with a reader book on the first night that had the word “station” in it. He is very logical and seems to be confused by being shown words with irregular spelling/pronunciation. He showed an interest in reading a year ago and we did start teaching him to read by sounding out, but only exposed him to words with regular spelling. I am confused myself by the golden words, sight words etc as I was taught to read 30 years ago using the Alphabet Code and am one of the few people of my generation that can spell! Is it possible to teach him to read phonetically outside of school or will this confuse him? I really don’t want to change schools but I don’t see how he will learn to read using the golden words method. He seems put off reading already and he’s only been at school six days so far.